This card may bring back some great memories for a few of my readers (those of us old enough to remember cutting the bottoms off Twinkies, Ho-Hos and the like, that is). 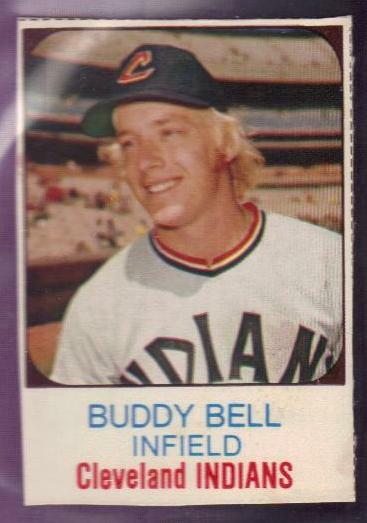 Hostess had 150 cards in the set and I bet a quick search would tell me that Topps supplied the photos. You can check that if you'd like. I'm surprised that this is the only one of these in my collection (er, I think so anyway), since several Tribers made it to the set. Ah well, something else to shoot for! The checklist of all 150 cards can be found at Baseball Almanac! I remember rifling through the boxes of twinkies at the grocery store looking for my favorite players. My exasperated mom would finally say, "Pick one now or you don't get any!" I remember looking on the bottom of boxes at the store for cards I did not have. I don't have any that survived from my original collection, so these were truly cards that my mom threw out. FTC: 1969 MLB Photostamps and...? ?